I recently realized that some of our classmates whom have not been in Toledo for a number of years do not know that "our" Bowsher building has been torn down and a new Bowsher building was built. The new Bowsher sits on the corner of S. Detroit and Arlington. It opened in 2008. 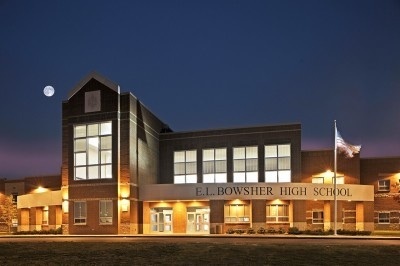 The old site of "our" Bowsher is now the site of Beverly Elementary. The old Beverly building has been torn down as was the Libbey High School building. Both sites are now grassy fields. Other schools in the Bowsher feeder pattern that were replaced are Arlington, Burroughs, and Byrnedale. You will enjoy the pictures of our "old Bowsher" and be saddened by the pictures of its demolition. Just click on this site. Hope you take time to check it out!